The traditional form of carpet cleaning is by steam cleaning at very high water temperature. Most professional carpet cleaners clean at 200 degrees or higher in order to get the maximum sanitization for their customers. By any standard steam cleaning is efficient and provides a clean most are looking for. Beyer Carpet Cleaning uses the traditional method of carpet cleaning. They sanitize at 210 degrees and vacuum up any excess water. It is important that your carpets are not over soaked when carpet cleaning because you are risking the growth of mold and mildew. 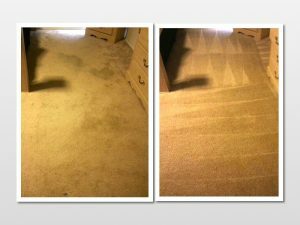 Beyer Carpet Cleaning San Antonio always removes any excess water in order to avoid this happening to your carpets. They know that having the healthiest carpets is important to you and your family. Steam cleaning your carpets alone will not remove any spots or stains but your carpet will be sanitized. In order to remove spots or stains traditionally carpet cleaners would use soap or detergents; however, soaps will leave residue in the carpet which will attract dirt causing your carpets become dirty quicker. Because of this back in the late 90s carpet cleaners stopped using soaps and began using solvents such as emulsifiers and enzymes which provided to be more effect for carpet cleaning. This is what Beyer Carpet Cleaning San Antonio uses for all their carpet cleaning and upholstery cleaning jobs. The solvents remove at least 95% of spots or stains such as food and drink spills and black or grey traffic areas. This method of carpet cleaning is widely used by most professional carpet cleaners. Beyer Carpet Cleaning also includes a deodorizer with all their best service cleaning. Most carpet cleaners will charge extra but not Beyer. It helps with the cleaning and guarantees your carpets will not have a smell after being cleaned. 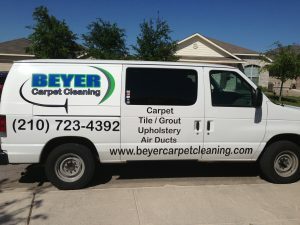 Beyer Carpet Cleaning may be the little guys on the carpet cleaning scene but they do everything by the book when it comes to carpet cleaning. Keeping to the current traditional methods of carpet cleaning as well as upholstery cleaning and tile and grout cleaning Beyer provides an amazing cleaning for the best prices in San Antonio.